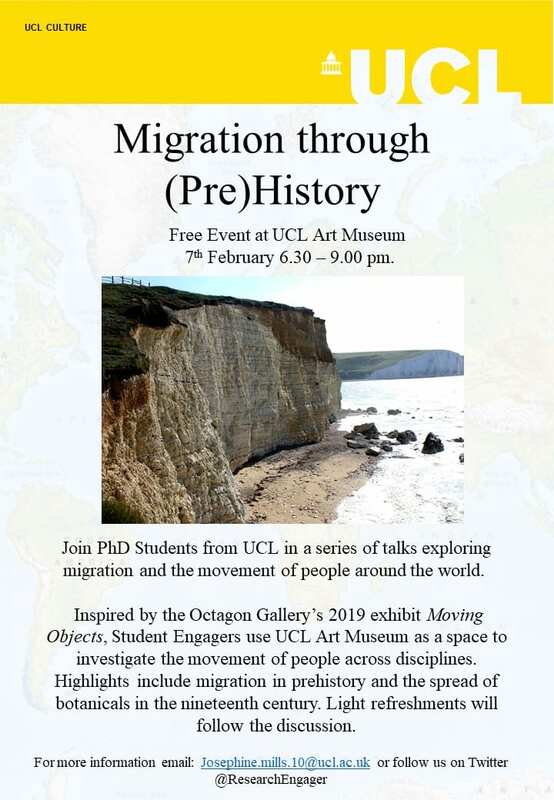 Coming up in UCL Art Museum, we’re hosting a series of talks around the theme of migration, and with Brexit coming up, there’s no wonder that’s what’s on our mind! We’d like to welcome you to join UCL’s Student Engagers Josie Mills, Hannah Page, and Jen Datiles, current PhD researchers, to explore the migration of people and the movement of objects through time and space. Inspired by the Octagon Gallery’s 2019 exhibit Moving Objects, Student Engagers will use UCL Art Museum as a space to investigate the movement of people across disciplines. Highlights include migration in prehistory and the spread of botanicals in the nineteenth century. Stick around for some wine and snacks afterward! 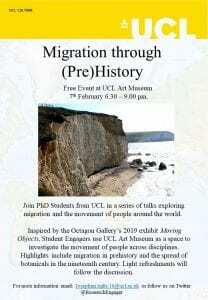 The event is free and will be held at UCL Art Museum on Thursday 7th of February from 6.30 – 9.00 pm. Josie Mills is a PhD candidate in the Institute of Archaeology specialising in prehistoric archaeology, applying scientific techniques to stone tools made by Neanderthals. In her PhD she is studying where flint used to make lithic artefacts comes from in order to look at movement and landscape use during the Middle Palaeolithic. She is also interested in how we, as modern humans, perceive prehistoric behaviour and the division often drawn between us and other species. Hannah Page is a fourth year part-time PhD student in the Archaeology department. 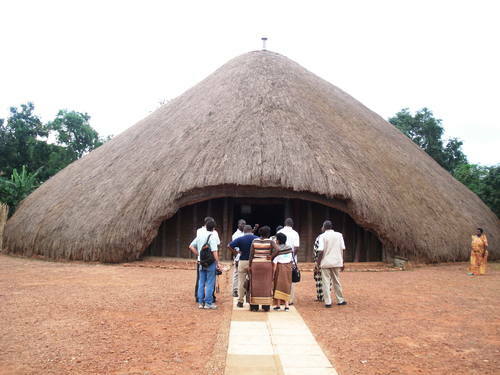 Her thesis focuses on sociocultural and political organisation and change in the early 2nd millennium AD in Uganda. Her research aims to reconstruct key aspects of life at the site of Ntuusi through the detailed archaeometric (scientific) analysis of pottery. 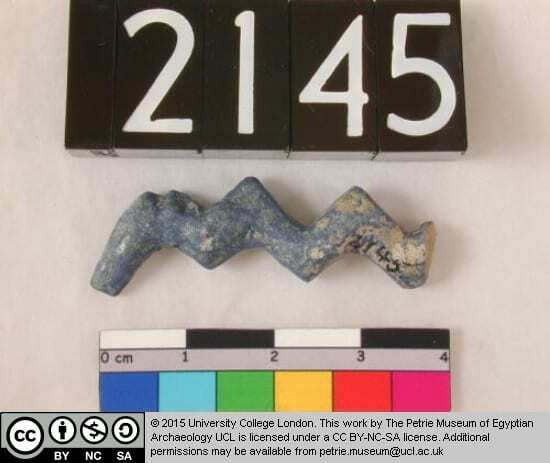 This type of ceramic analysis can be used to understand scale and organisation of production practices, identify cultural groups and understand networks of local and long-distance trade and exchange. She is also active in running excavations and coordinating field schools and outreach events in the UK and sub-saharan Africa. Jen Datiles is a PhD student at the UCL School of Pharmacy studying food and medicinal plants that were exchanged between Asia and the Americas via the Spanish Galleon Trade (1565-1815). Using selected plant species as case studies, her research aims to link historical documentation with modern use-knowledge of traditional food-medicines through fieldwork and work in various archives and herbaria. As usual our events in the museum aim to be inclusive and interactive, with lighthearted discussion about the topic of the event and how this might relate to our own research areas. You can book the event by clicking here. Booking is encouraged but not essential. For my blog post this week I am starting a new series based loosely on the Plagues of Egypt. 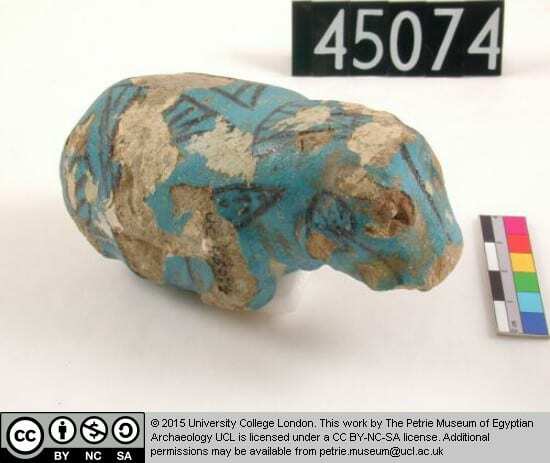 The idea came to me while I was working in the Grant Museum and was thinking about possible connections between the Grant and the Petrie Museum of Egyptian Archaeology. 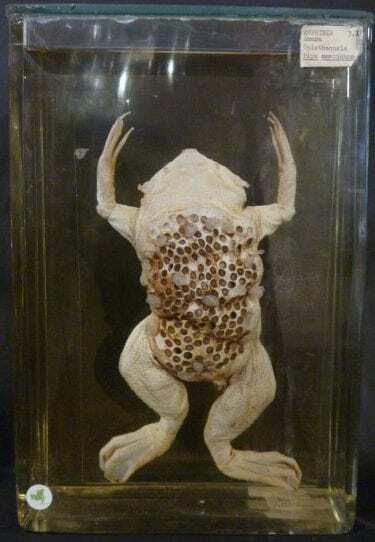 For some reason as I was stood next to the insect cabinet, the plague of locusts was the first thing that came to mind.. and conveniently, I have already written a blog post about the 2nd plague of frogs. Before I launch in I must note briefly that I don’t particularly wish to talk about religion or religious texts. 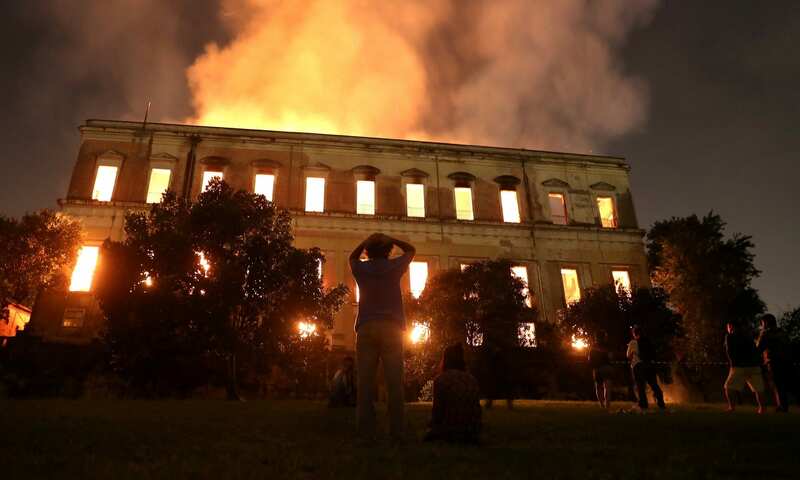 Instead I will use the 10 plagues to discuss some (hopefully) interesting zoological and sociocultural phenomena that link the two museums. So, what are the 10 Plagues of Egypt? The first plague of water turning into blood is an interesting one to start with, but the topic of the two liquids is very pertinent to both collections. Water has an incredibly important role in the ideological and cultural landscape of ancient Egypt. The waters of the Nile were the lifeblood of ancient Egyptian society. It provided vital irrigation for farming, transport through the kingdom, and was linked closely with ideology and religion in Egypt. The Greek Herodotus is recorded as calling Egypt the “gift of the Nile”, implying that Egypt itself was born from the river—this further develops an idea I have discussed in a previous blog post: that the Nile is deeply connected with fertility. With this in mind it is not difficult to see how devastating the idea of water turning into blood would be for Egyptian society. One papyrus from the twelfth dynasty (c.1991-1803 BCE) interestingly states that the “river is blood“, which has caused some debate over the occurrence of the plagues in Egyptian history. However, the most probable explanation is that during the harsh flooding of the Nile the disturbed red river silt would create this phenomena. 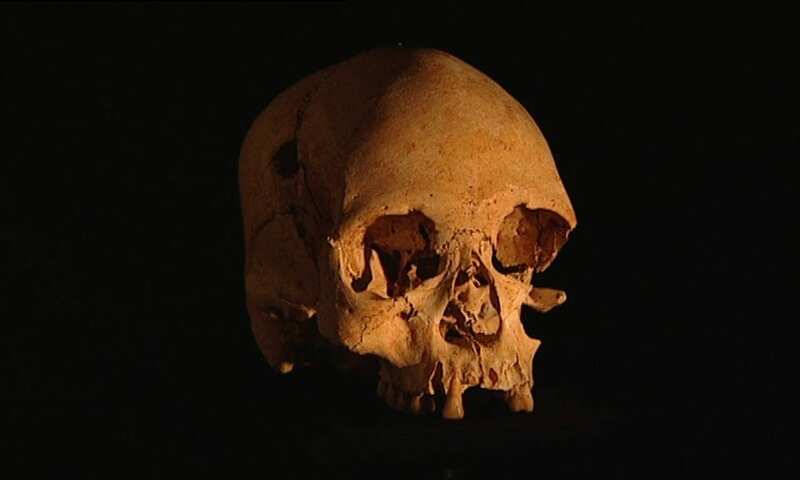 Blood as well as water was also symbolically significant to the Ancient Egyptians. Wine was given as “blood of the Gods” during certain religious offerings, something akin to the Christian symbolism of using wine as the blood of Christ, and the deity Shesmu is also linked with blood, being the lord of wine and the “great slaughterer of the gods”. It is also not difficult to connect the Grant Museum with water and blood as they are both vital components to many living creatures on earth. 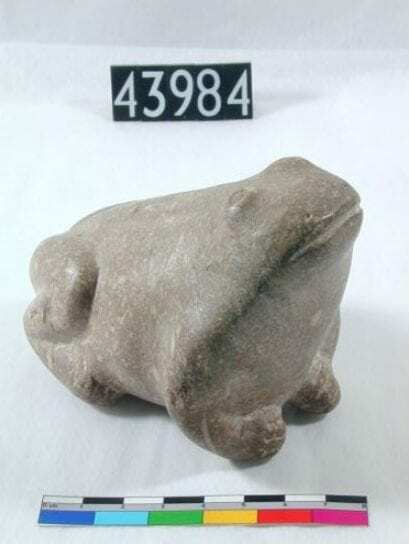 For this post I wish to focus in on one of my favourite water dwellers in the museum and one that has a deep connection with ancient Egypt. This mammal can certainly displace a lot of water and coincidently produces a fluid over its skin that is often called blood sweat. 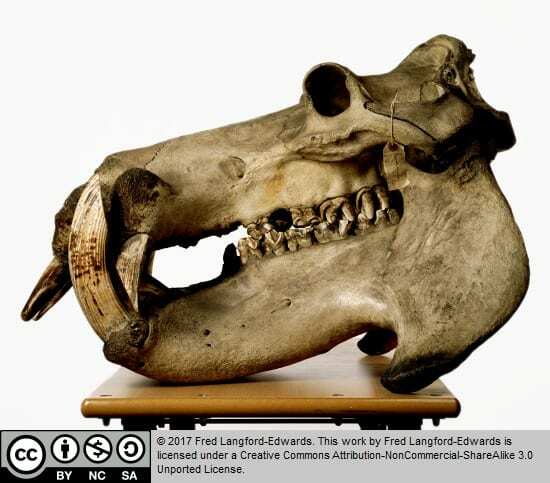 The hippopotamus, known as a “river horse” by the ancient Greeks secretes a substance called hipposudoric acid. The liquid is red, which gives it its colloquial name, but it is neither sweat nor blood. In fact the secretion is an example of an evolutionary masterpiece—a natural sunscreen! This fluid is very much needed due to their skin being exposed in blistering high UV environments (and being a redhead who works in sub-Saharan Africa- I can fully appreciate this)! As well as the blood sweat creating UV protection it is also a very good antiseptic, which is useful as hippos can be extremely aggressive animals. Sadly, the hippo is no longer found in Egypt but in dynastic times it was a hazard to boat travellers along the Nile and was present in ideological and cultural symbolism. 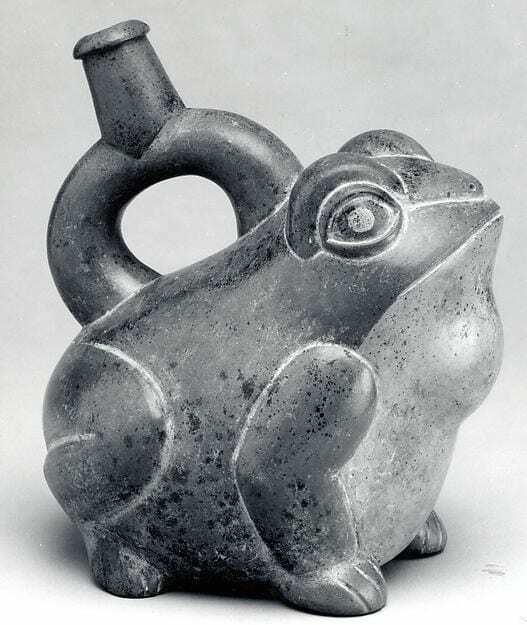 The deity Taweret was often depicted in the form of a pregnant hippo as she represented fertility (like frogs!). 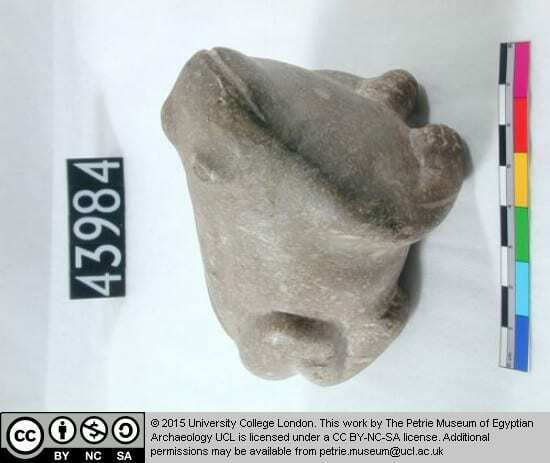 Hippo figurines are also found on ancient Egyptian sites (Fig 3) and hippo tusk ivory was used to make pendants, amulets and sculptural pieces. As you can see, water and blood were and still are incredibly important cultural symbols, most probably due to their inescapable connection to the natural world and to life and death. It really is no wonder that that these themes come up time and time again all over the world. I hope you have enjoyed my first foray into the Plagues of Egypt as much as I have… I’m quite excited about what direction they might take my research in next!